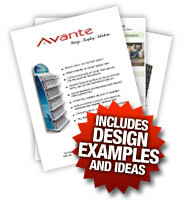 Download our Avante POP Displays Brochure Package. Take Your Sales to the Next Level. Receive our 17 page brochure with more info, testimonials, photos and a design worksheet.